Part of The Island, a massive ex-municipal building in central Bristol that formerly housed a fire station, two police headquarters and a courthouse, the Fire Station (which is actually part of the Old Police Station) runs a schedule of drop-in classes, and, around that, open training. 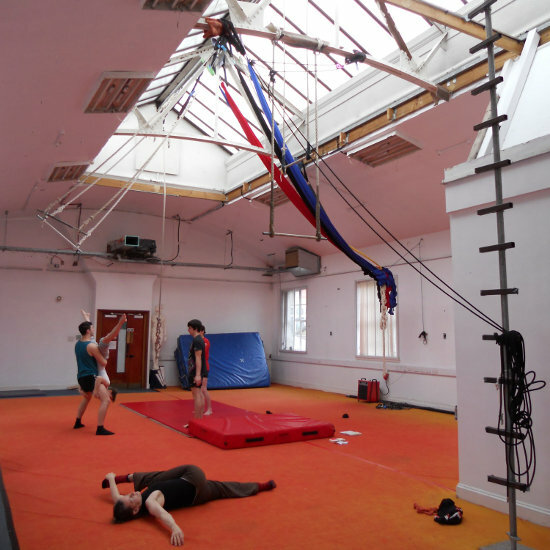 It's not a huge space, but relaxed and rarely full, used by many of the The Invisible Circus' roster of changing performers and associates. The Invisibles, a band of circus artists putting on large-scale immersive shows in the free party spirit, occupied the Island for three years from 2008; they've since moved on to the Paintworks, but some of their props from their immense Carney Ville shows remain in the Island courtyard and corridors like the artefacts of an abandoned town.